Hey y'all, thanks for visiting my fundraising page! This August, I'll be riding 192 miles across Massachusetts to raise money for cancer research. It'll be my second ride in the Pan-Mass Challenge (PMC) and I couldn't be more excited to go the full distance this year! 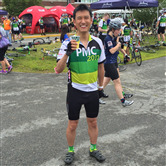 I'm a proud supporter of the PMC because it is leading a charge to beat cancer. In fact, last year 100% of rider-raised revenue -- $47 million! -- went directly to support the Jimmy Fund and Dana-Farber Cancer Institute's tireless commitment to finding a cure. Our team -- Precision for Kids -- has partnered with Dr. Katherine Janeway, a Harvard, Dana Farber Cancer Institute, and Boston Children's Hospital Pediatric Oncologist (and herself a cancer survivor), who is working with Precision Medicine to develop specialized treatment plans for pediatric oncology patients. Please join me in the fight to cure cancer by donating to my ride and thanks in advance for supporting this incredible event and cause!